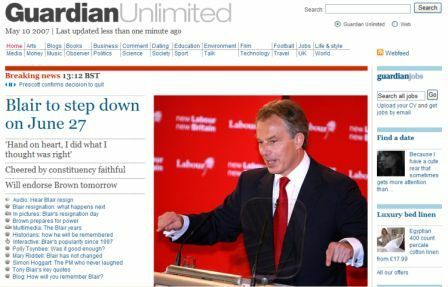 The area above the fold is now dedicated to breaking news, while the area below provides links to the various Guardian Unlimited sites and blogs. It looks great, although it is ever so slightly clunky. Try scrolling up or down the page – there is a delay at this end, probably linked to their use of a news scroller at the top of the page. A small thing to iron out. 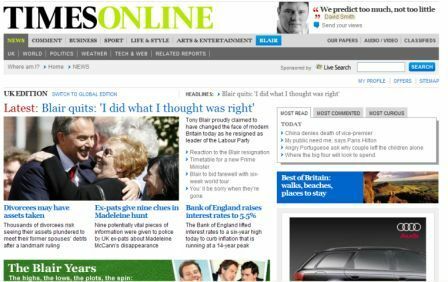 Now then, who notices a passing resemblance to recently-revamped homepage for The Times? 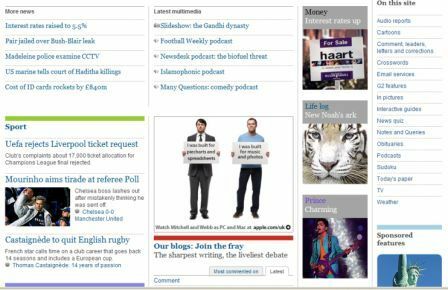 Both homepages are big improvements on earlier versions, but has somebody released a design template for online newspaper page layouts that we don’t know about…? The cost of failing to usability test designs before deployment has unfortunately been shown again in Scotland’s controversial election results. Windows Live Hotmail, the successor to MSN Hotmail, has launched worldwide today, offering the most comprehensive upgrade to the email service since its inception in 1996. The new version of Hotmail has been in beta for the past two years, with 20m users testing it. From yesterday, the 280m active Hotmail accounts will be migrated over to Windows Live Hotmail.